After the constructions of Our House, we were left with a huge pile of rubbish. In order to minimise cost of getting rid of it, the whole lot had to be sorted into various categories, since many types of rubbish can be brought to the local dump for free, but unsorted rubbish is expensive. The first trip was for cardboard, the 2nd trip for plastic, the 3rd trip for "treated wood", i.e. painted or stained wood or MDF. Then there was a 4th trip for plastic, followed by so far three trips for branches and tree roots. The first photo shows one of these loads, obviously before it being secured. The second photo is of the same load after being secured for the journey of some 15 km. With careful planning, we managed to get rid of all rubbish without any cost at all. 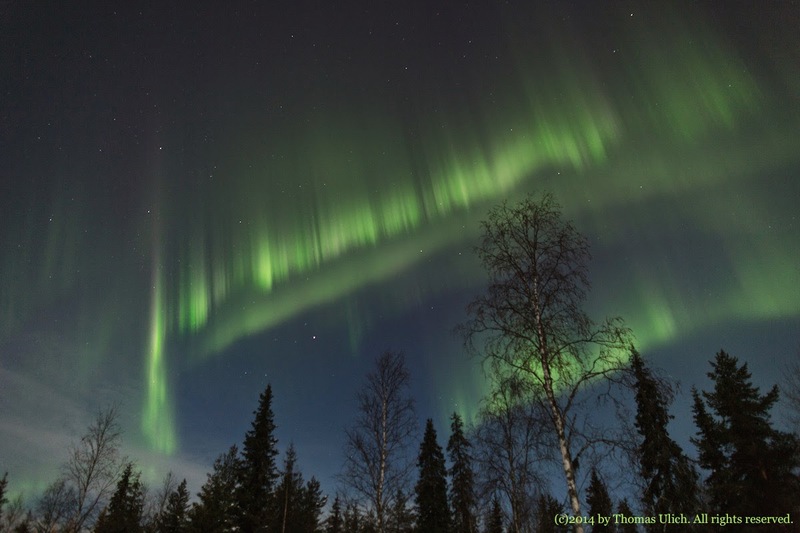 At least three more journeys for wood are expected before the snow comes in October. Besides having that red heavy-duty wheelbarrow, we decided it was time to buy a normal one for smaller jobs around Our House. Yeah, ok, it doesn't have a winch – but it's yellow! Anyway, the instructions clearly said to mount the axle (indicated by the yellow arrow, click to enlarge) on top of the frame. However, when lifting the wheel barrow on the handle bars, the arch in front of the wheel went so low, that it rammed into any minor obstacle and thereby made moving around on anything but a flat path impossible. The problem reminded me of an improvement some off-road people do to their 4x4s, which is called "Spring Over Axle" conversion. The idea is that instead of hanging the leaf springs under the axle, they are mounted on top of it, thus giving a lot more ground clearance. Here a "Frame Over" conversion was called for. 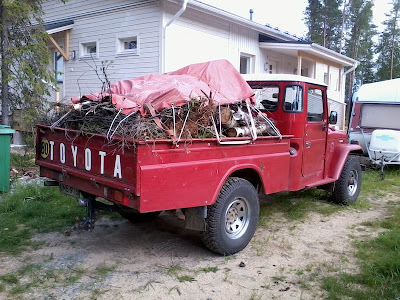 The implementation of this on something as basic as a wheel barrow is shown in the photo montage above, which shows both before and after. The axle is at the same location in both photos (arrow), but it has been changed from mounted above to mounted below the frame, thereby lifting the front arch by some 7 cm or so, but at the same time lowering the handle bars and tilting the whole thing backwards. The result: it works! Much better than before! When the digger came to make room for Our House, quite a few trees had to be felled, and these were scattered all over the place. In mid-May, when the snow was gone, the land had dried, but the mozzies hadn't arrived, my neighbour Eero and his friend Risto dropped by "to get some exercise." 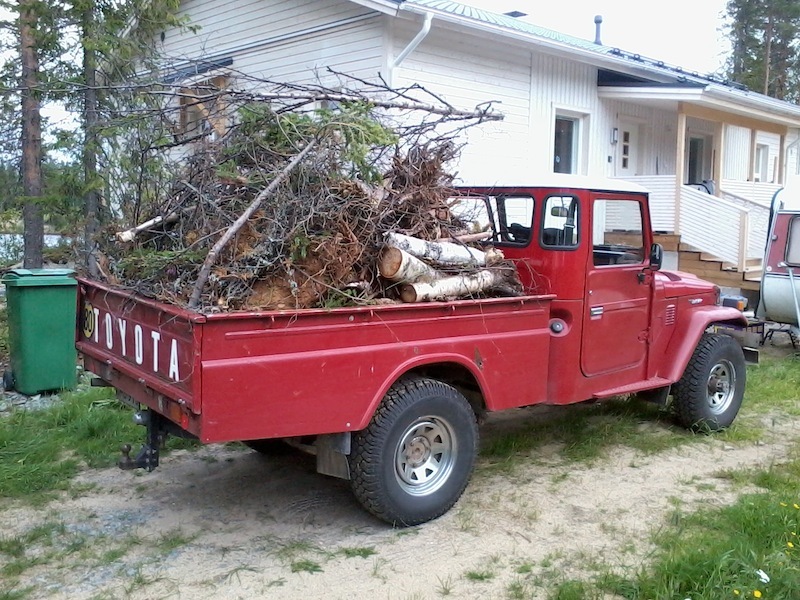 The result of which was that they had chopped all trees up in small logs some 30-40 cm long. 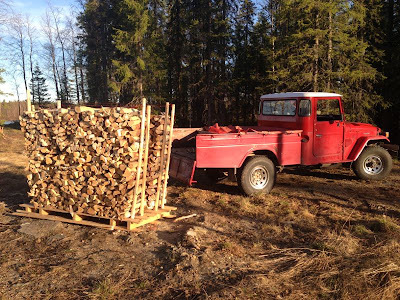 Then Eero dropped by again, and together we used a special wood splitting machine to break the logs in suitably thin pieces for the fireplace. In the photo above there's Eero's quad bike and behind it the machine to split wood. Extremely handy that thing! Also here on the internet, a big Thank You to Eero and Risto for their help! 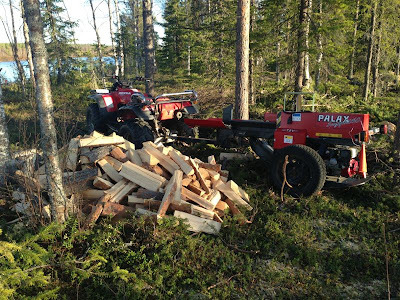 Afterward all these logs needed collecting and piling up neatly. 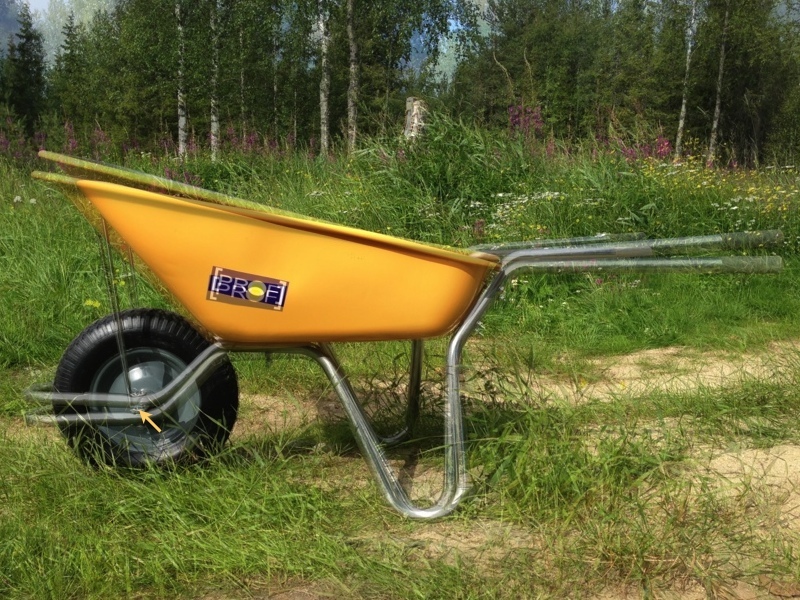 The tool of choice is a wheel barrow, which in my case isn't powered by one man, but instead by the 90 horses of its 3.6 litre 6-cylinder engine! While our wheel barrow was rapidly approaching its 33rd birthday at the time, there was no stopping it from moving some logs around – the best gardening tool ever! Not much has happened over the summer, and the few things that went on will be reported on in due time. When the previous blog post on Our House went out, we were already moving house, and subsequently it's been a very busy time catching up with all the things that had to stay behind due to the construction. The photo above shows the final stage of the work on the chimney. 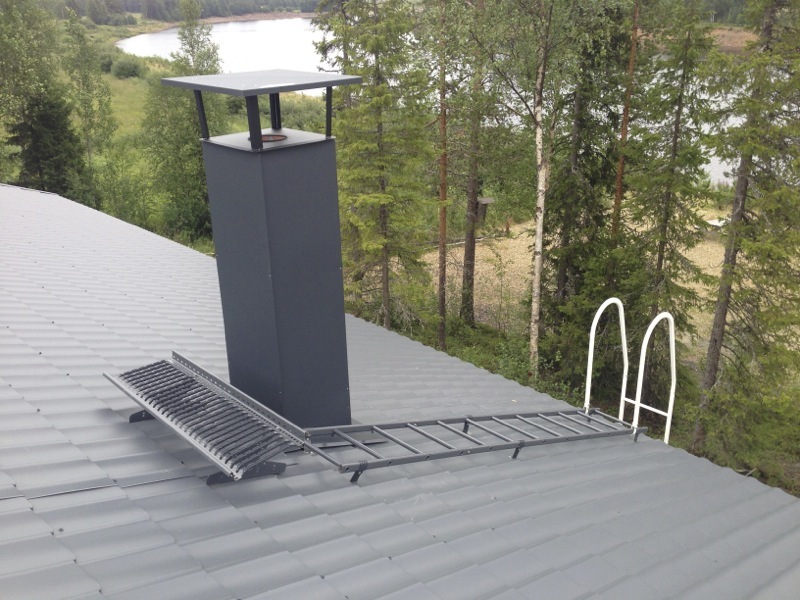 It is a legal requirement in Finland to have ladders going up to the chimney, which are easily accessible from the outside. These were installed on Day 64, i.e. on Monday, 22nd April 2013. Yes, it took me a while to put that on the blog, and the photo was taken in July, in case you are wondering where all the snow's gone. Stay tuned, there'll be more. No worries, we haven't abandoned Our House and moved to Iceland. Already for a while we've been wondering if it's worth the effort to maintain a server computer for e-mail and web pages, and when our domain ulich.org was due for renewal this summer, we decided to outsource this service to OrangeWebsite in Reykjavík, Iceland. There are two key reasons for choosing Iceland: first, the services of OrangeWebsite are running on 100% green energy, i.e. their servers are powered by geothermal energy, which is in abundance on volcanic Iceland. The photo above is of the volcano Hengill, which is one of the sources of Reykjavík's energy, and also the namesake of the server our services are running on now. Secondly, and equally importantly, Iceland has some of the world most rigorous laws on data protection and privacy. While this blog is still hosted by Google, we are investigating if we can transfer it to Iceland, too. The difficulty lies in the need to port it from Blogger to WordPress.